This is geelove living in Marine Parade. I work in West Coast. 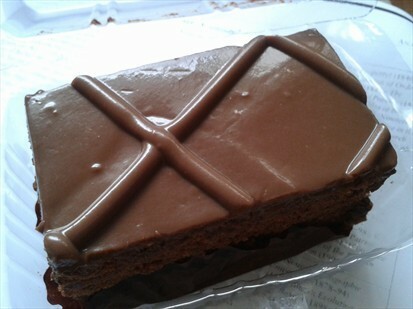 At 1.50 per cake, this slice of cake fairs low as the taste of chocolate is lacking. Recommended to serve it chilled, this cake is a good afternoon snack and is not too filling. The chocolate coated fudge on the outer surface of the cake tasted more like cream rather than fudge. The cake is quite chewy and blends well with the chocolate cream coating on the outer layer. For its low cost, it is ok to try once but not marvelous due to the lack of chocolate taste in the fudge cake.